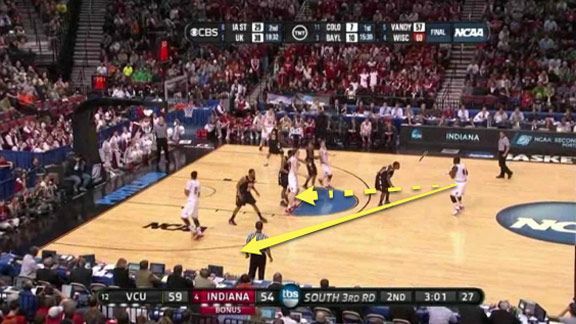 With three minutes left in Saturday’s second-round game against VCU, Indiana was trailing by five points. The Hoosiers were struggling to get Cody Zeller, one of their best offensive weapons, any touches, and he seemingly disappeared for minutes at a time. But down the stretch, Indiana coach Tom Crean used set plays to get his star player the ball, giving way to seven points in the final minutes and a two-point, 63-61 victory. The key was a play that got Zeller the ball on the elbow. 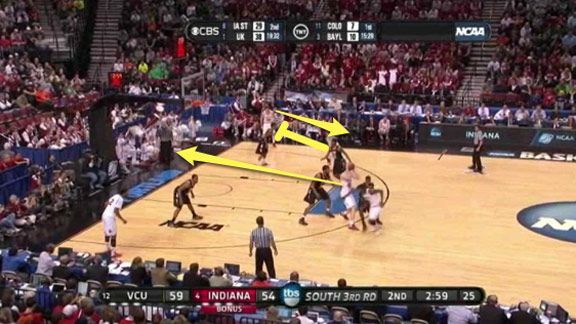 Indiana sets up in a horns formation, with Zeller on one elbow and Jordan Hulls on the other. Victor Oladipo brings the basketball up and gets it to Zeller on the elbow. After making the entry pass, Oladipo spaces out on the wing. 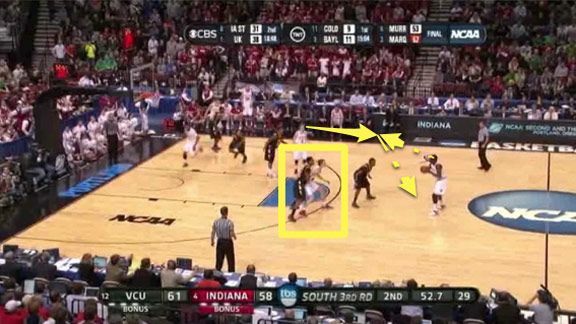 As Zeller makes the catch, Hulls moves without the ball, dropping down to the corner to set a pin-down screen. He fills the weakside to occupy the defense. As Oladipo cuts, Zeller fakes a handoff and immediately drives to the rim. Since Hulls has drawn the defense far from the basket, Zeller has a lot of space to work without the threat of the defense collapsing in on him. Zeller drives right from the elbow and goes straight to the basket. Meanwhile, that weakside action keeps the high defender on the wing occupied with his back to Zeller, and he is caught in a position where he can’t help. 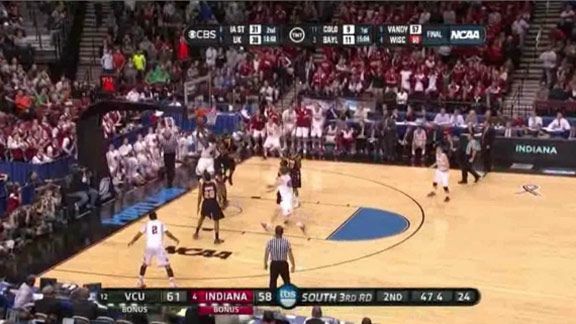 It’s Zeller’s quick turn and drive that really makes this play. He moves swiftly, perfectly timed with the weakside action. There is no chance of the help getting there. Again, the weakside action keeps the help defense occupied. This time Zeller doesn’t immediately drive, but rather hesitates, setting up his man for a dribble-drive move. No help comes, and Zeller draws a foul. 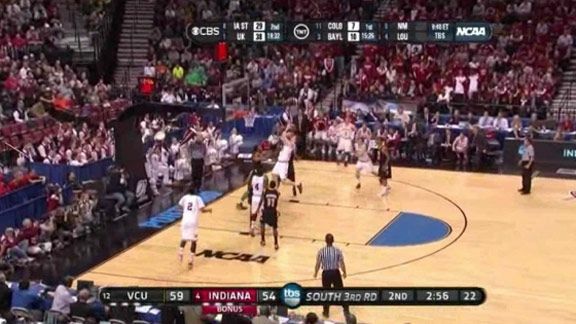 Now that they’ve seen this play twice, VCU is expecting it. They respond by taking Zeller out of the play. Oladipo is nearly stuck when he picks up his dribble, but Hulls gets open for the pass. He gives the ball right back to Oladipo, who can now reset. So what does Zeller do when he realizes that he can’t make the catch on the elbow? He sets a ball screen for Oladipo. 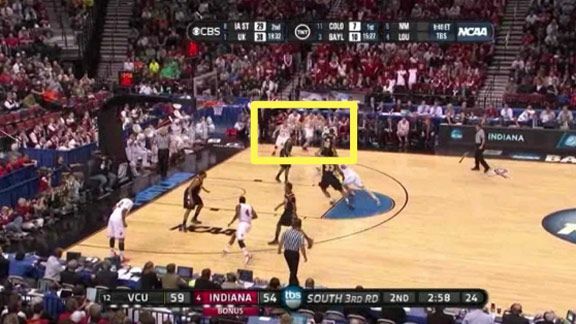 Because VCU was working so hard to keep the basketball out of Zeller’s hands, they aren’t in position to help on any ball screens. Crean deserves a lot of credit for calling the same play multiple times. 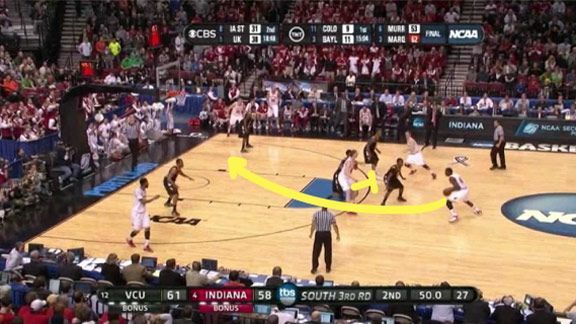 Indiana was able to exploit the defense that focused solely on Zeller, converting on the simple yet effective pick-and-roll. Next stop for Indiana — the Sweet 16.